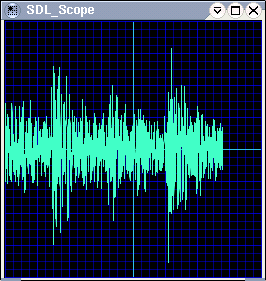 SDL_Scope is a simple example application that reads sound from a sound card and displays it on the screen. It contains an SDL-style sound input API for Windows and Windows CE(porting to CE was easy, the CE sound API is identical!). It uses Simple Directmedia Layer, of course, and the SDL_gfx graphics primitives library. It has been tested under PocketPC®/ARM®, Windows 98®, Windows 2000®, and Linux® AMD64®. Update! I have ported the sound input code to Linux® and made a tarball. The screenshot to the left shows SDL_Scope running under Xorg®. It is quite useful in fiddling with my soundcard's mixer, just fiddle until appears. I've also made an XMMS© visualization plugin out of it, just because. With Linux® and Windows® now both working, I plan to seperate the sound API from SDL_Scope into it's own general purpose library. Send comments, patches, ports etc to Tyler Montbriand, Tyler Montbriand.